A steam engine train was built to be an exact replica as the one that used to run in the region. 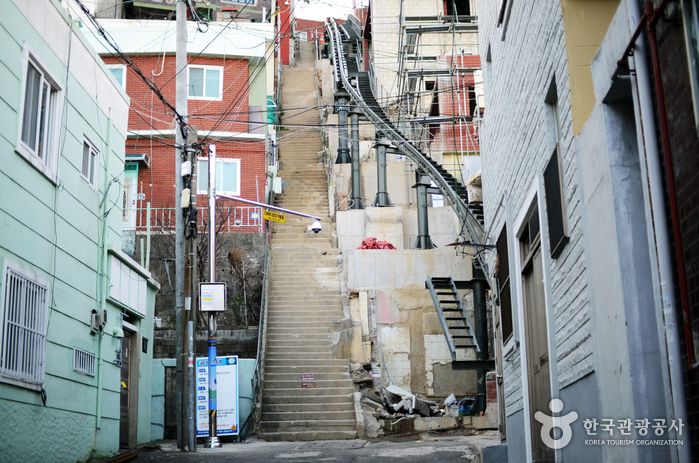 The train runs 10km between the old Gokseong Station (Seomjingang Train Village) and Gajeong Station. Passengers can enjoy the scenic view of lush greenery along the Seomjingang River and flowers alongside the roads at springtime. 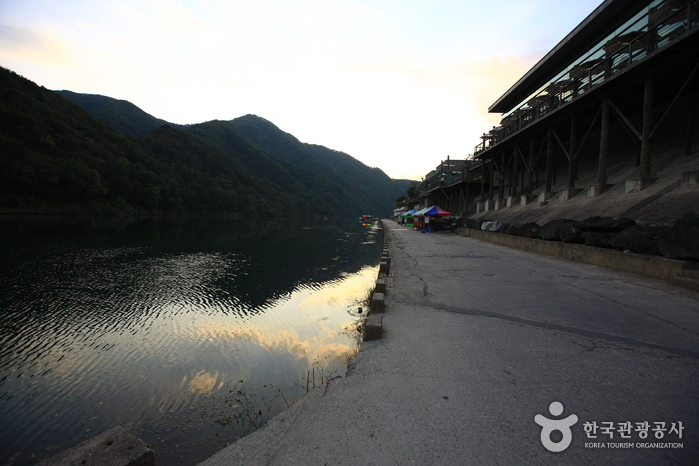 The Gangchon Resort is a small village nestled along the Bukhangang River in Chuncheon, Gangwon-do. The river is on one side of the village, while Bonghwasan Mountain and Samaksan Mountain are on the opposite side, creating a beautiful scenery from all directions. 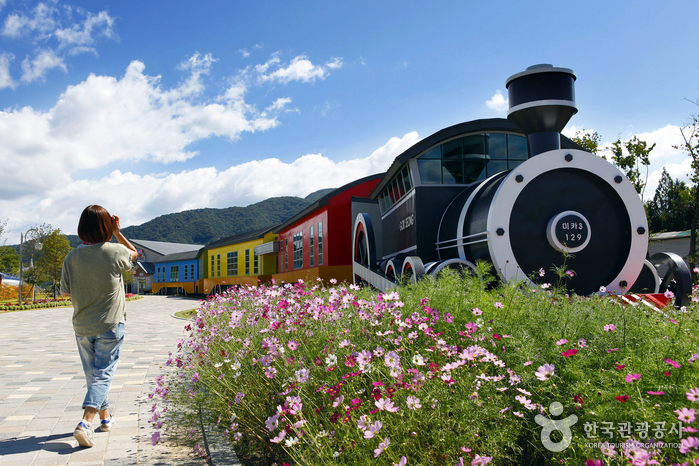 Gangchon Station is conveniently located near the entrance to the recreational area. Many young couples enjoy taking the romantic train rides to this cozy little village. The village area has campgrounds, a youth hostel and other lodging facilities, bicycle paths, bungee jump facilities and many other recreational areas. In addition, the area is especially famous for mountain biking. There are many places to rent bicycles; for those who are not accustomed to mountain biking, motorized bicycles are also available. 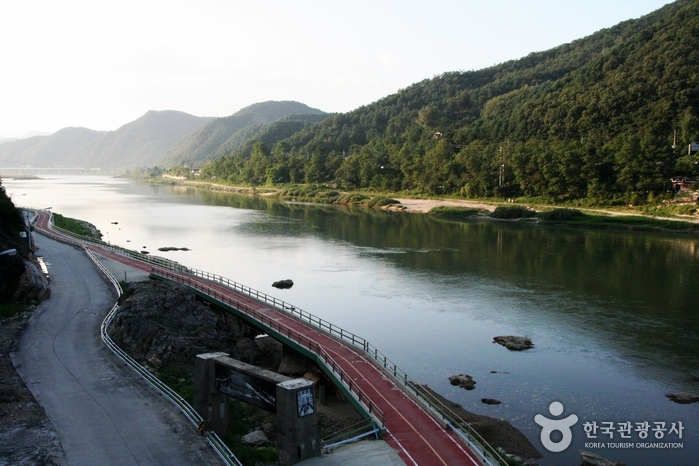 The most popular bicycle course is the well-made route to Gugokpokpo Waterfall. Bicycles can be left in the parking lot located near the entrance to the waterfalls. From the entrance, it is just a short hike up to the waterfall. The 67 meter high waterfall is a natural wonder. People flock to this spot in the summer to escape the heat and in the winter to see the ice sheets gracefully frozen in time. 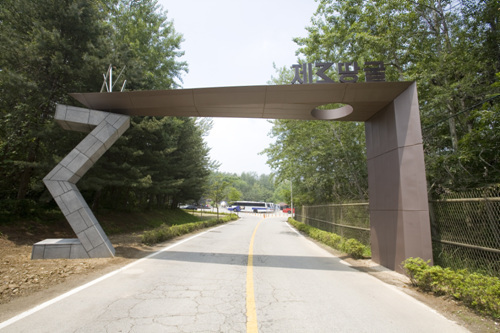 Geumgang Resort has become popular thanks to the construction of the Geumgang Service Area. With scenic mountains and a large beautiful lake, this resort attracts many visitors. By crossing a nearby dam, visitors can get to Usan-ri. Recently, many modern homestay facilities have been built in this area, and it has been transformed into a perfect destination for families and young people alike. 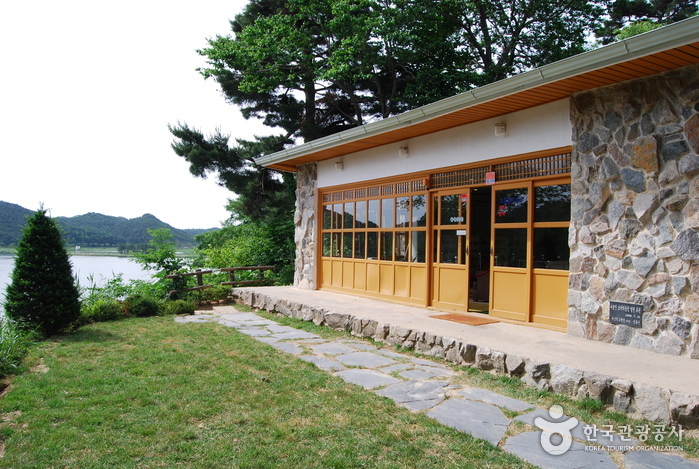 Utilize the many facilities of the Geumgang Service Area while relaxing at Geumgang Resort. Also, Joryeong-ri Local Food Village is located across from the Geumgang Service Area, and offers a variety of local foods. During the 1950's three leaders, Kim Ilsung, Rhee Syngman and Lee Ki-poong had summer houses built around the lake of Hwajinpo. The villa of Rhee Syngman, Korea's first president, was built in 1954 but fell into a state of disuse by 1961. It was not repaired until July of 1997 by the army, and was fully restored in 1999, opening as an exhibition hall. The 3rd Tunnel was discovered by South Korea in 1978. It spans over 1,635m in length, 2m in x_width, and 2m in x_height and is located 52km from Seoul. It is estimated that approximately 30,000 soldiers could move through the tunnel per hour. The scale is similar to the 2nd Tunnel, but it was thought to be more threatening as an invasion tool than the 1st and 2nd Tunnels. Located only 4km away from Imjingak toward the southwest and 3.5km from the Tongilchon area, it is accessible by car in approximately 45 min from Seoul. 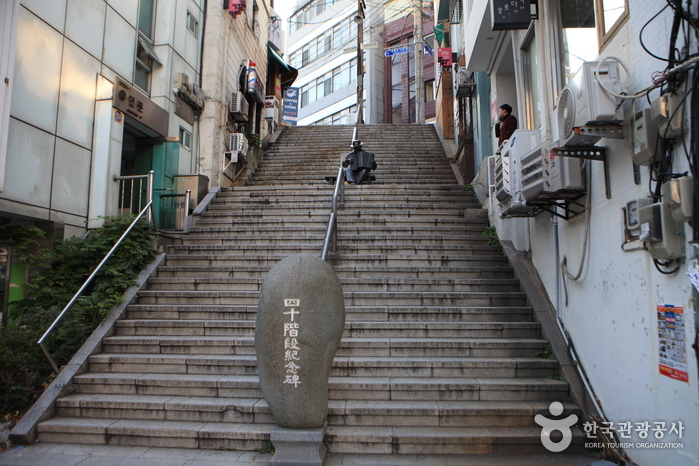 The 40-step Culture & Tourism Theme Street is a 450m-street which leads up to the 40-step stairway of the '40-step Cultural Center' and continues on to the Palseong Tour. The time-honored 40-step stairway embodies the joys and sorrows of refugees and those displaced by the Korean War. The entire area has been recently renovated to reflect life in Korea in the 50s & 60s. Geommeolle Beach is a very small beach, reaching only about 100m in total length, with a name literally translating to "black sand" in Jeju dialects. The nearly all-grey beach will look strange at first, but soon visitors eyes will adjust and they will begin to pick out where the cliff and rocks end and the sandy shore begins, all in various shades of grey. It is very tiny in size but a charmingly attractive destination for both travelers wanting some quiet time and extreme sports-enthusiasts seeking fun maritime activities along the seashore. 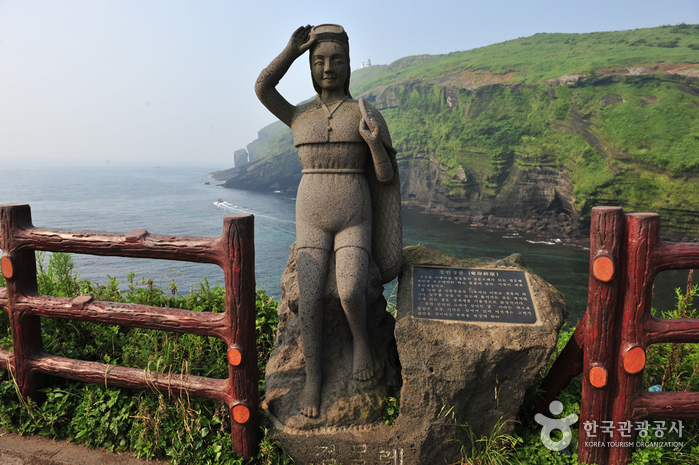 The place also displays an amazing view of the sunrise over the Jeju sea, making the beach a destination worth visiting. Jeju Island, designated as Jeju Special Autonomous Province, lies southwest of the Korean Peninsula and is the largest tourist destination in Korea. The whole island was designated as a special tourist zone, and wherever tourists go, they can look upon beautiful scenery. Every year, about 8.7 million people from Korea and abroad visit this fascinating island that measures 73 km across, east to west, and 31 km, from north to south. Jeju Island earned the UNESCO triple crown, being designated as a World Natural Heritage, Global Geopark, and Biosphere Reserve as well as one of the Seven Wonders of Nature. The climate of Jeju is quite different from the temperate climate of mainland Korea. Since the island has a subtropical climate as well as a subarctic one, there are many peculiar plants that can only to be found on this island. The unique sight of Jeju Island captivates travelers. 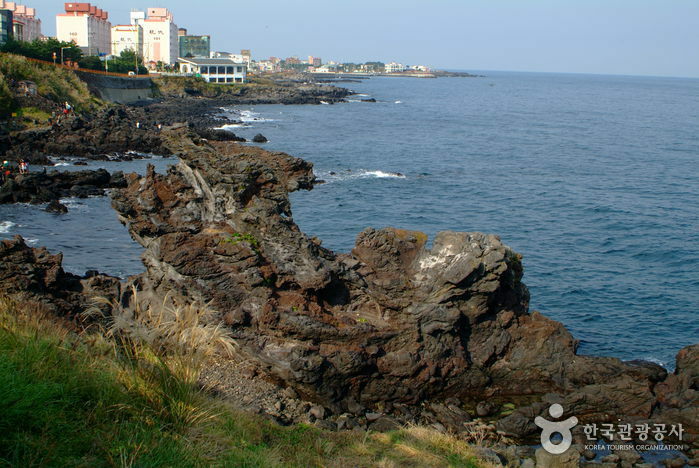 The scenery that represents this volcanic island of Jeju, such as Jusangjeolli Cliff (the pillar-shaped joint on the beach) were created by Hallasan Mountain and Oreum (parasitic cones in Jeju dialect). 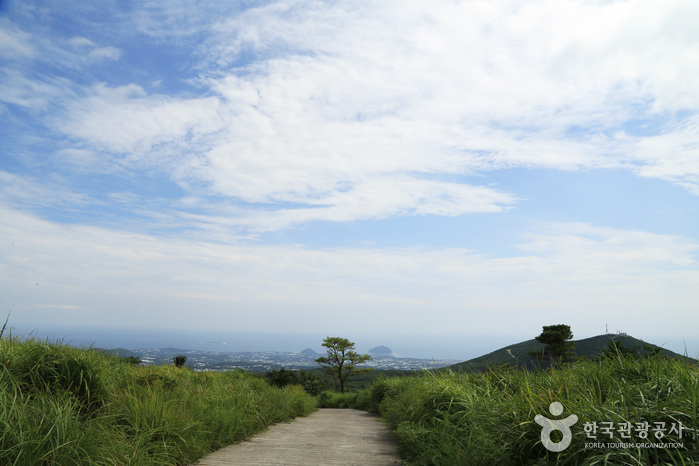 The piedmont area that visitors encounter on their way from the beach to Hallasan Mountain is a gift of nature and the piedmont area on the way to Geomun Oreum, where Jeju World Natural Heritage Center is located, is worth seeing. Another unique aspect here is the Jeju dialect and lifestyle. Gwangju Kimchi Town is dedicated to kimchi, Korea's representative food. Visitors have the opportunity to learn about the history and culture of kimchi, as well as experience making this dish first-hand. A variety of programs are available for all groups of people, from children to adults, and foreigners. Honinji is home to a myth that agriculture and farming started on Jeju Island when the Samsinin (three founding demi-gods) who lived in Jeju married the Samgongju (three princesses) and started raising cattle and ponies and planted the seeds of five grains. There is a pond here called Honinji Pond (pond of marriage) where, according to the legend, the wedding ceremony was held and three caves which served as bridal rooms. Together with Samseonghyeol (three large holes on the ground where the three demigods emerged from), Honinji is a great place for tracing the origin of the founders of Jeju Island. In the summer, the area is in full bloom with red lotus flowers.